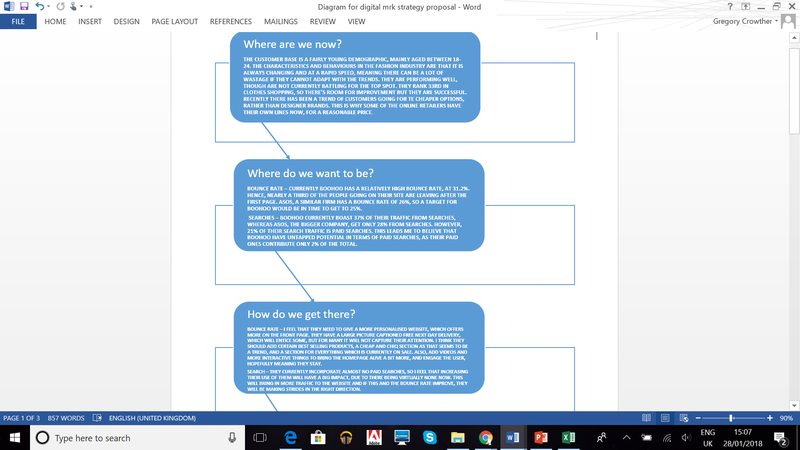 For the final aspect of the project we must complete a Pecha Kucha, based on the initiatives which we have already researched and put forth in our proposal. 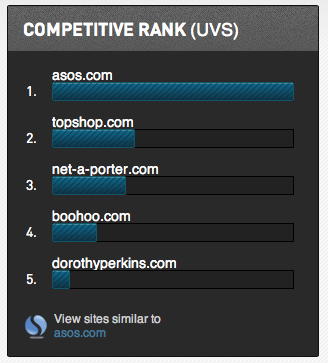 The main initiative I am going to focus on is trying to lower the bounce rate of Boohoo. I also started research into another field, with incorporating paid searches, however it is difficult to gather data as it is hard to say how large the effect of paying for searches will be on their website traffic, without being given insider information. This leaves me with the lowering of bounce rate, which is something most websites will be striving to achieve, as it essentially means more business for them. The “bounce rate” from the webpage back to Google—that is, for a given search query, the percentage of searchers who return from a “clicked-through” webpage back to Google’s SERP to try some other webpage. A webpage’s bounce rate has the reverse effect of its CTR: a high bounce rate indicates to Google that searchers entering that query are disappointed with that webpage (Killoran, 2013). If this is believed to be the case, there will be moves by firms to ‘encourage a higher CTR while discouraging a correspondingly higher bounce rate’ (IBID). So how is it that firms are able to get their bounce rate up? It is things like endorsements from celebrities, having their page advertised on popular websites/forums and getting a strong social media platform, as to advertise to the widest number of people, at the lowest cost. One possible explanation for the effectiveness of celebrity endorsers is that consumers tend to believe that major stars are motivated by genuine affection for the product rather than by endorsement fees (Atkin and Block, 1983). There are many celebrities who have ‘die hard’ fans who will follow what they do, as that is somebody they look up to and potentially aspire to be. Seeing one of their inspirations sporting a certain brand of clothes will push towards them at the minimum thinking about where the said celebrity’s clothes are from, and possibly going a step further to finding the website or actually purchasing the clothes. This is a tactic which plays on people’s devotion to certain public figures, as like Atkin & Block said, an explanation for celebrity endorsements is because the public think the celebrities actually like the clothes, rather than having a monetary gain. This is one tactic brands may use to try and push their product and brand image forward. However, this is not the only way they can do this. The emergence of social media has brought about a new route to take when firms are looking into their marketing side. It allows a message to be broadcast to people from all across the world, and compared with TV and radio campaigns, will be very cost efficient. ‘Whereas marketing with traditional media like newspapers, television and news websites was about delivering a message, marketing with social media is about building a relationship and conversation with your audience’ (Drury, 2008). There is one thing which is just having your advertisement up on a billboard, or to see on a banner of a popular website, but this does not induce people into actually visiting your website or making a purchase from it. The way this is done is with interactions, getting the people involved and then when they feel like they are a part of it, they are likely to make more purchases or at the least, not ‘bounce’ away after clicking onto the homepage. They can do this through things like social media campaigns, competitions for customers to take part in and being active in the community, listening to peoples’ feedback, answering their queries and taking steps to make it a better experience for everybody. If these are followed, the word will spread that Boohoo are doing all of these positive things for the community, and these coupled with things like celebrity endorsements, could be the key to unlocking that lower bounce rate, and making it a more successful website, more able to compete with the likes of ASOS. Overall, I feel that Boohoo already have a solid customer base, and have been successful in their previous ventures. This does not however by a long stretch mean that they are perfect and without fault. I feel their social media aspect is not bad, but could do with more actual interactions with people, as that is what they will remember, not as much what the website looks like. Also, showing support and partaking in fair practices could put them in the public eye for good reasons, adding to their potential customer base. With a few small incremental changes and some time to let the changes take effect, Boohoo could be reaching further, and grasping an even larger audience, and bringing success to themselves. https://link.springer.com/article/10.1057/palgrave.dddmp.4350096 [Accessed 5 Apr. 2018]. Killoran, J. (2013). 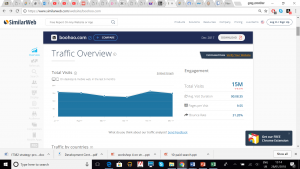 How to Use Search Engine Optimization Techniques to Increase Website Visibility – IEEE Journals & Magazine. [online] Ieeexplore.ieee.org. Available at: http://ieeexplore.ieee.org/document/6463486/#full-text-section [Accessed 19 Mar. 2018]. An initiative which I proposed on the previous blog post, was for the firm to undertake and employ paid searches onto their website. This was only one of a few, including working to lower their bounce rate, and increase their site traffic, however the one which I feel is the more straight- forward to tackle is increasing their paid searches. A firm can have paid searches, with things like PPC (pay per click) or they acquire organic searches when people are naturally looking for their site. Since around 2012, there has been a crackdown by google on websites who have been gaining top spots on their pages, through unethical practices. These changes have been codenamed into things like ‘Panda’ and ‘Penguin’ (Wikipedia, 2017). The changes have essentially been cutting out websites who have been writing key- words and then changing it into the colour of the background. This makes them appear higher on the search engine, as we can’t see the word, however google will pick it up. Also, there are a number of sites who get many other sites to put their link up, giving unnatural traffic which shouldn’t be there. These are all unfair practices as they are not paying, they are merely trying to cheat the system. As google have cut down on these, it leaves a space for a firm such as Boohoo to seize on the paid searches function. 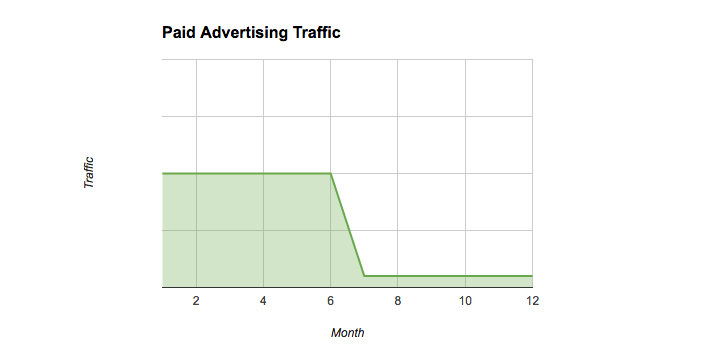 ‘Paid traffic will of course cost money upfront, but it does have a key advantage over organic traffic: it’s quick. If you need to grow your top line quickly, this shouldn’t be overlooked! It also offers a way to get instant feedback on whether you are doing the right thing’ (Craig, 2016). 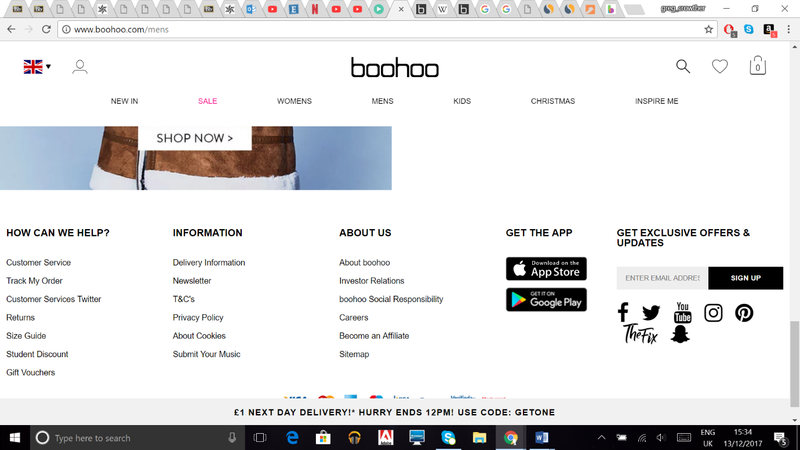 It is not that Boohoo have a deadline in which they must grow, but inducing paid searches I feel will snowball their firm into something much larger, and more on ASOS’s calibre. You must be able to weigh up the pros and cons of the organic to paid searches and decide whether it is worth it for your firm. For Boohoo, who boast under 3% of their search traffic from paid searches (SimilarWeb, 2018), those not taking part in PPC’s or other paid searches is keeping them at a disadvantage. Their close competitor ASOS, who have a significantly larger share of the market, invest money in paid searches and it is clear to see they are making a difference. Organic searches are fine, and will make sure the company stays growing its customer base, but for short term market share gain, paid searches could give them a kick-start in the right direction. Trust gained while enjoying entertainment and communication provided on the sites seems to contribute greatly toward a luxury brand’s profit’ (Kim & Ko, 2010). Many of the firms who were ousted by google would not have built trust with their customers, as rather than trying to make connections, they were trying to cut corners and maximise their own profits in the short run. This is why playing the long game with elements of organic and paid searches is the more effective way. However, there is of course risks when it comes to running a scheme like this. ‘There are times when you will have to incur great amount of money for this type of online advertising’ (Paul, 2017). This is to be expected when running a campaign of any sort, but there is the risk that all this money could have been paid and there will be no positive effect on the firm. The paid campaign may just miss or not be effective at reeling customers in, leaving the firm with less money to spend and still without a market share which has grown. 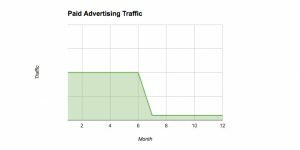 There is also the disadvantage that people may just ignore the PPC and click on the organic website anyway as that’s what they are accustomed to. This means there is a chance they will be once again, paying large money for no actual gain. 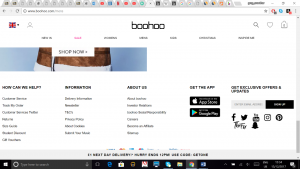 Overall, though there are certainly drawbacks and risks with the paid option, for Boohoo, it is something I feel they must at least try. They have gained a respectable market share, but I feel that without this extra boost they may become stagnant. If their Paid campaign falls through and is ineffective then it would be back to the drawing board, but I believe that incorporating this will give them very quick results. The channel which I am going to be investigating in this case, will be ‘Social media marketing’ within the fashion retail industry. In recent times, social media has become a massive part of our day to day lives, with most people having accounts on platforms such as Facebook, Instagram and more. This global usage gives way to opportunities, as now there is an audience all around the world which your products can reach. ‘Social media creates the possibility in marketing to move from blasting our messages to interacting with our prospects’ (Evans, 200?). What this means is that, rather than on a billboard or advert on the TV, they have space to advertise their products over social media. However, with the other forms of advertising it is a strictly one sided thing, on social media it allows the customers to interact with the company itself, which gives them somewhere to voice their opinion on the service/products. ‘Allows customers and prospects to communicate directly to your brand representative or about your brand with their friends’ (Vinerean, 2013). This is another argument for the case of social media, as people already use it to communicate with their friends, so when there is a new product they like, it can be shared over social media, and from there, and word of mouth can take it even further. ‘Two of the exceptions are Distribution and Energy firms, which adopted on average less than one application’ (Culnan, 2010). This is an indicator that marketing over social media is not fool proof, and there are obviously instances where it is not necessarily a good addition. For energy firms for example, the product is not varied from customer to customer, meaning there is a lack of things for most customers to talk about, and overall it has a wider base of business customers. However, this varies industry to industry, as with fashion retail I feel it is much more prominent. The industry as a whole attracts a generally young adult audience, who are the main users of social media, so it would appear that the two go hand in hand. Boohoo, the online fashion retailer with an army of 16 to 24-year-old fans, has nearly doubled its profits, helped by paying celebrities and other “influencers” to promote its products on Instagram (Neate, 2017). What the firms will do in situations like this, is pay public figures to showcase their products to their fans, who tend to be in the retailers target audience anyway, which builds traction for the products, as people seem more likely to trust something if somebody they follow promotes it. One of the main elements for social media being such an important part of a companies’ marketing these days, is that it provides them with no just another platform to promote, but also gives somewhere else for them to receive feedback. Almost all companies will have a ‘live chat’ or customer contact station, however social media essentially gives them a forum for customers to interact with themselves and one another. ‘Finally, they need to develop absorptive capacity so they can learn from the content their customers generate’ (Culman, 2010). 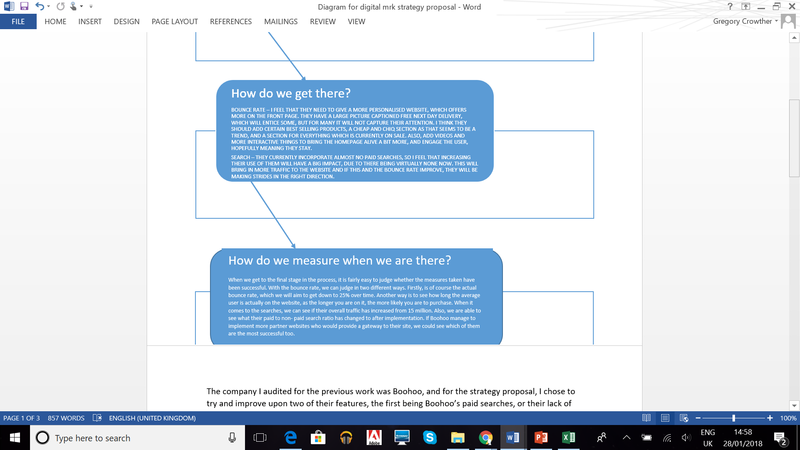 This enforces my previous statement that they must adapt and learn from the feedback generated by the customers, so they are able to change with the times and stay on the ball, providing exactly what the customers are looking for. And finally, we come to the conclusion ‘trust and purchase intention were highly related. Customers’ trust was strengthened via interaction with other users as well as brand on social media sites. Trust gained while enjoying entertainment and communication provided on the sites seems to contribute greatly toward a luxury brand’s profit’ (Kim & Ko, 2010). From the research I have been doing into this channel, it is clear that there is a strong correlation between social media emerging, and companies incorporating it into their marketing campaigns. The article by Kim & Ko tells us that when customers gain trust, there is much more intention to purchase, and trust was fuelled by interactions with other users, alongside the websites providing entertainment. The last move in a change toward more social media interaction, would be trying to get customers to discuss their experiences amongst each other, on platforms like Facebook and Twitter. Also, if they are active on their social media, posting some things for entertainment, and also things like special offers, they could become even more successful in their overall campaigns. Games Radar, is a useful website for one who is looking for an insight into the world of gaming. The role of the website is a community, as different people go and review their experience of some digital entertainment. It has a very simplistic layout, but in this case it pulls it off effectively, having nothing on the page wasted. What started as a site for merely posting game related blogs, has flourished and now receive lots of traffic. They are trying to meet the framework of the Online Consumer’s Hierarchy, and optimize the selection for consumers, which websites have been trying to achieve from the start, and are currently attempting it by branching out into not just gaming, but also TV and Films are included now. Even people who don’t enjoy gaming could spend hours on the page looking at posts, as what started as a site for strictly gamers, has now become something that almost everyone could use and enjoy. ‘An ad-hoc development approach to building complex Web systems quickly leads to poorly designed websites that may cause disasters to many organizations (Ahmad et al., 2005). However, in the case of Games Radar, this is not the case. They have not tried to over complicate their website, they have a straight forward layout, with the information you are looking for very accessible. I think one of the reasons they are successful is this layout, not having long paragraphs all over the page, but instead nice images, and a small title, with a key in the top corner of the picture indicating which sector of the website it is related to. In terms of something to improve on, I think they could potentially provide links or a gateway between all of the things they are talking about in the blog posts, and where they can be reached, so if they had an actual retailer collaborating with the site, which could bring more traffic for all the parties involved. I think the website is very effective at what it does, and has good elements, all which make it easy for the consumer, and meet the Online Consumer’s Hierarchy, as what they are looking for on a blog site, is straight to the point and easy to find the specific area which you are looking for, which Games Radar has accomplished in my mind. However, ‘with few publications and risks that inadequate evaluation practices are becoming standardized (Woolrych et al., 2011)’. There are not analytic websites which can be used to track the progress, however it is hard to quantify how well a website is doing, without asking people their actual opinions which is time consuming. Hernandez, A., & Resnick, M. L. (2013, September). Placement of Call to Action Buttons for Higher Website Conversion and Acquisition An Eye Tracking Study. In Proceedings of the Human Factors and Ergonomics Society Annual Meeting (Vol. 57, No. 1, pp. 1042-1046). SAGE Publications. Woolrych, A., Hornbaek, K., Froekjaer, E., and Cockton, G. (2011). Game of Thrones. The most watched tv show around the world, overtaking some well renound ones, such as The Walking Dead and Narcos as it flies to the top of the list. Some people would argue that it should not be there, but with a fan base that wide, there must be something which they are doing right. There had been a huge wait for the fans, as there’s atleast a year between each season and they always leave questions unanswered to draw the viewers back. The thing is, its not just people tuning in on Monday nights to watch it, it’s talked about all over social media, with a recorded 800,000 interactions from their social campaign, and reached a massive 43 million people across 168 different countries. In New Zealand, there is one major TV broadcasting service, SKY, who in this campaign have worked together with the countries leading and most influential advertising group, DDB. With two strong powers like this, it makes sense for their Game of Thrones campaign to be a great success, but it is not always a walk in the park. SKY have a 49.4% market penetration in their home country of New Zealand, but have the exclusive rights to GoT in New Zealand, so by working with DDB, they are trying to convince the rest of their people that it is worth signing up. 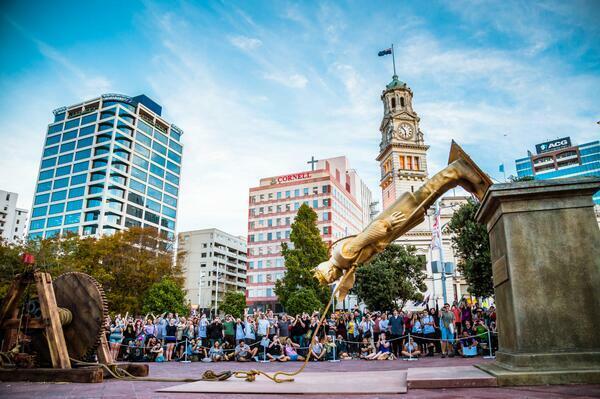 So we have these two powerhouses of New Zealand working together but there will innevitably still be problems. Firstly, I would say that the show itself is quite niche, even if it is the biggest one in the world, and not everybody is into that kind of entertainment, with regular scenes which I would be uncomfortable watching with my mum. How can you convince people to watch something they don’t like, even if the advertisements are crafted to perfection. However, when it comes from per say, a close friends mouth, there is much more reason to give it a chance, as chances are you trust your friends. So, they accomplished this by the social media campaign, culminating in ‘#bringdowntheking’ where people were more and more vocal about king Joffrey and their hate for him. It felt like some of the power was transferred to the people as their wishes eventually came true and the king was killed, but social media mentions of GoT had gone through the roof, and this was monitored by Brandwatch. Brandwatch is one of the worlds leading social media monitoring and analytical tools, which allowed these two companies to see how their campaign was going, and enables them to analyse that information which they have picked up, meaning they can see new opportunities as they come up.